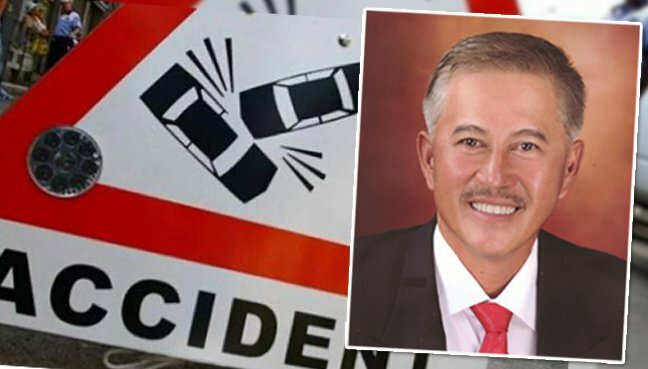 Pelagus state assemblyman George Anak Lagong, 55, is in critical condition at the Sibu District Hospital after a car accident at Sebangkoi, about 10km from Sarikei town at about 4pm yesterday. According to his brother-in-law Nelson Janting, George was with his wife Sumi Janting, 50, and two sons when he lost control of his four-wheel-drive and plunged into a ravine. “George sustained serious head injury while his wife and a son suffered light injuries. The other son escaped unhurt,” he said when contacted here today. He said Sumi and her son were then taken to the Sarikei District Hospital for treatment while George was sent by ambulance to Sibu, where he underwent a four-hour surgery..
George won the Pelagus seat as an Independent candidate in the 10th state election in 2011, and later joined the Sarawak Workers Party, before joining the new Barisan Nasional-friendly Tenaga Rakyat Sarawak (Teras) party, which he left after a while. According to Nelson, George and his family were on their way from Kuching to Bintulu for the Gawai Dayak family reunion at his house there.